Mr. X is not available at the moment, he is at a Bad-Anon meeting. If you would like to leave a message you can leave it at the front desk and he will chase you and mess your face up as soon as possible. 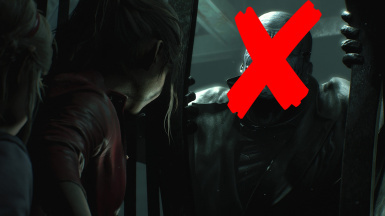 But seriously, this mod removes Mr. X from the game. It doesn't make him invisible, he's not there. He can't hurt you anymore. I'd suggest going to the 2F locker room sit under the shower clutching your knees. This doesn't break scripted events, X has made sure to leave friendly ghost in his place to lift up the helicopter for you when it's time.